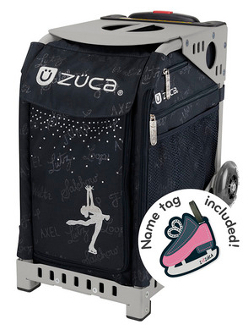 ZÜCA Ice Queen was designed with the elegance of an ice skater in mind. The fluidity of motion, as the skater gracefully flows on the bag, is accented by falling snow of the winter season. Embellished rhinestones bring the snow to life, making the Ice Queen bag a fashion accessory fit for the beauty of an ice skater. Name tag included. Can also be used as weekender bags when you purchase the Pro Packing Pouches.